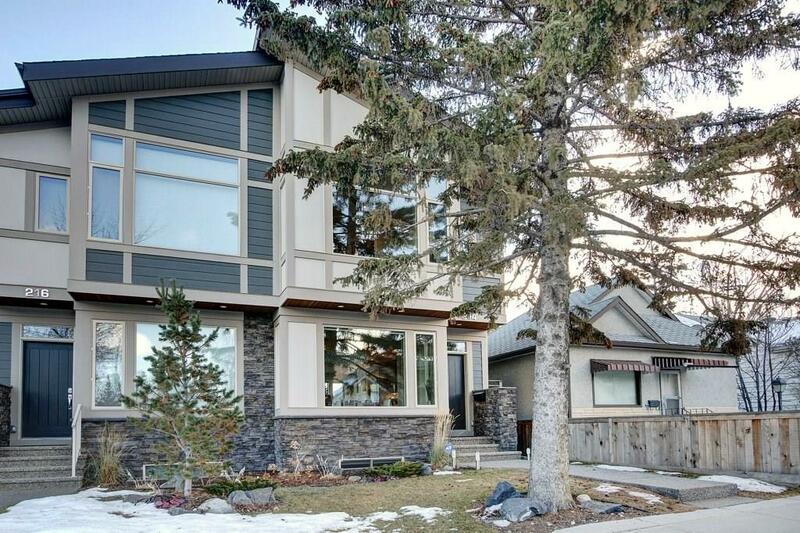 DESCRIPTION OPEN HOUSE SUN 2 - 4 PM!...GORGEOUS, MODERN HOME, HIGH END FINISHINGS, LOCATED ON A QUIET STREET - WALKING DISTANCE TO DOWNTOWN, THE ZOO, NUMEROUS PATHWAYS, PARKS, RESTAURANTS & MORE! Huge windows fill the home with light & 9 foot ceilings & hardwood floors create a sleek, welcoming space. The amazing contemporary kitchen offers quartz counter tops, high end stainless steel appliances with 5 burner gas counter top. The open plan main floor is wonderful for daily living /entertaining.With the kitchen as its heart it offers excellent sight lines to the dining room & the lovely living room & its cozy fireplace. The Master Suite is bright & spacious & has a walk-in closet & ensuite featuring a sauna shower – true luxury on cold winter days! Two family bedrooms & family bathroom complete the top floor. The guest suite in the basement ensures that you & your guests have privacy during their visits & there is a great family room too! Lovely curb appeal, close to transit, schools & has a built in sound system!